Place the packet of yeast in the bowl. Add 1 cup warm water and 2 tablespoons of sugar. Mix well. Transfer the liquid to the bottle and place the balloon around the neck of the bottle. After 10 minutes what to do you notice? Did the balloon start to inflate? This is due to carbon dioxide being released from the yeast. Put a drop of the yeast mixture on your microscope slide. Place a cover slip on top and look at the yeast at several magnifications. 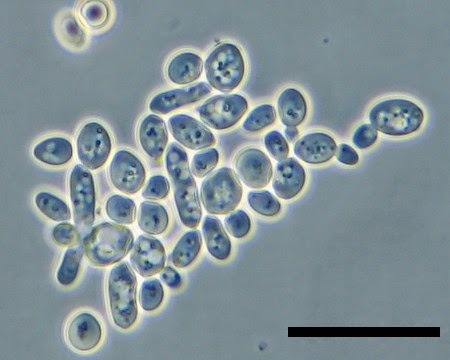 Draw an image or capture a picture of the yeast at 400x magnification. Can you see the yeast cells? Yeast cells in young wine. Image courtesy microbiological garden. Yeast is used to make bread, wine and beer through fermentation. Bread uses sugars in the flour to produce energy, releasing the alcohol ethanol, which evaporates, and bubbles of the gas carbon dioxide, which make the bread rise. Bread yeast is sometimes used to make beer as well. In beer, sugars from the cereals such as barley are used by yeast to produce ethanol and carbon dioxide. Yeast size varies depending on the type, but typically yeast measure 3-4µm in diameter. Most yeast reproduce asexually by mitosis. And therefore, yeast is an easy substance for scientists to study.